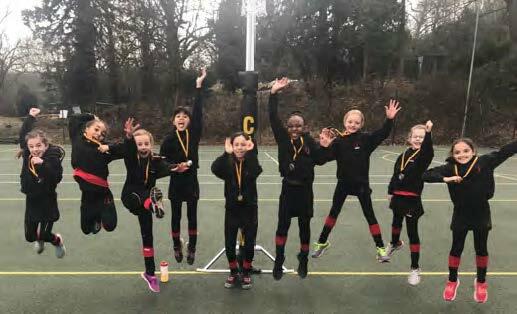 This week the U9As went to Caterham for their tournament. There were 8 schools in total so the girls had 7 matches to play, all against schools that we hadn’t played before. Matches were 7 minutes one way and our tournament captain was Tianna. The girls got off to a flying start by winning their first match 7-0 against Lingfield College. They won 6-0 against Micklefield and 4-1 against Reigate St Mary’s. A great run so far! Their 4th match was against the hosts Caterham who has also won all their games so far. This was a close match and despite Copthorne having the majority of possession the final score was 2-1 to Caterham. Not losing their heads the girls continued to play outstanding netball. They won their remaining matches 3-0 against Sutton High, 3-2 against The Hawthorns and 6-0 against Russell House. The girls finished in 2nd place with a whopping 30 goals scored and only 5 scored against them. The best stats of the tournament! Huge congratulations to; Ruby, Anna, Talia, Priya, Tianna, Bella, Jennifer, Rachel and Bethany for their efforts. A very proud coach!